Whether you’re looking for the perfect breakfast, a casual lunch, or a fine dining experience, you’ll find plenty of restaurants to choose from in the Gun Barrel City area. We’ve put together a few options for you to consider when you’re looking for delicious things to do in Gun Barrel City. We encourage you to explore and find your favorites, as well. The Flying Grape and Bean is located at 1223 Harbor Point Rd. in Gun Barrel City, TX. This address is in the 75156 zip code area. They can be reached by phone at 903-887-8686. They are open Tuesday – Friday from 7 AM – 3 PM and Saturday from 9 AM – 3 PM. Choose one of their amazing gourmet coffees with your breakfast. Breakfast options include pancakes, French toast, crepes, and paninis. They serve up vegan choices, such as their vegan ciabatta bread, alongside fresh vegetables and fruits. Charming atmosphere and incredible food. Coffee Love is located at 1014 Main St. in Gun Barrel City, TX. This address is in the 75156 zip code area. They can be reached by phone at 903-713-5000. They are open Monday – Thursday from 7 AM – 9 PM, Friday – Saturday from 7 AM – 10 PM, and Sunday from 9 AM – 7 PM. They have espresso drinks like the Americano and Breve alongside non-coffee drink like Chai Tea and Granitas. If you’re looking for a quick breakfast, this is the perfect choice. Order your coffee and select a muffin, cinnamon bun, biscotti, or one of their sandwiches. Cochran’s Cafeteria is located at 816 W. Main St. in Gun Barrel City, TX. This address is in the 75156 zip code area. They can be reached by phone at 903-603-9621. They are open Sunday – Thursday from 9 AM – 9 PM and Friday – Saturday from 9 AM – 9:30 PM. A local favorite, this restaurant serves up home-style dishes every day of the week. They are well known for their chicken and catfish, so you might want to give those a try. Other entrees include pork chops, roast beef, meatloaf, and beef livers. They have daily specials, and you can even order online via their website. Tommy’s BBQ is located at 206 Old Gun Barrel Ln. in Gun Barrel City, TX. This address is in the 75156 zip code area. They can be reached by phone at 903-887-0265. They are open Monday – Saturday from 11 AM – 8 PM. Serving up tasty dishes since 1988, this restaurant is well known for their home-style vegetables and homemade barbecue sauce. Other items you may find on their menu include ribs, chopped beef, slices brisket, pork sandwich. You’ll enjoy the charming decor, too. Hector’s Mexican Restaurant is located at 1900 W. Main St. in Gun Barrel City, TX. This address is in the 75156 zip code area. They can be reached by phone at 903-887-1179. They are open Monday – Saturday from 11 AM – 9 PM and Sunday from 11 AM – 3 PM. 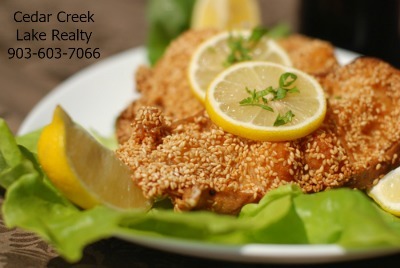 With over 25 years experience in the kitchen, the owner of this restaurant is no stranger to preparing delicious meals. You’ll find items like fajitas, enchiladas, soups, salads, and tacos. They also serve up home-style dishes like meatloaf, fried catfish, and steak. 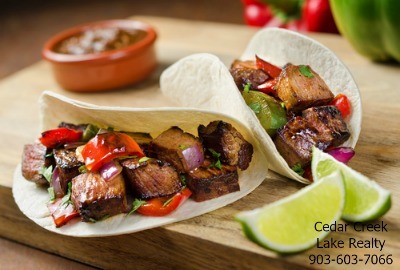 Lake Jackson Seafood Restaurant is located at 1610 W. Main St. in Gun Barrel City, TX. This address is in the 75156 zip code area. They can be reached by phone at 903-887-1199. They are open Monday – Thursday from 11 AM – 9 PM and Friday – Saturday from 11 AM – 10 PM. This restaurant is serving up incredible seafood dishes in a casual environment. Menu items we’ve seen include Red Snapper, King Crab, Lobster, Shrimp, Oysters, Scallops, and Flounder. We’ve heard that the portion sizes are generous, so bring along your appetite. 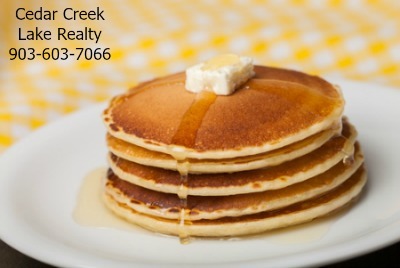 This list of delicious things to do in Gun Barrel City is brought to you courtesy of the Cedar Creek Lake Realty Team. Keep us in mind for all your real estate needs. You can reach us at 903-603-7066. See all Gun Barrel City, TX homes for sale right here. View MLS listings by price, size, location, neighborhood, zip code, school, number of bedrooms, and so much more! When you decide to buy or sell Real Estate in Texas, call 903-603-7066.